Grace is experiencing trauma from the death of her mother and can only remember bits and pieces of the event she witnessed. Her memories are muddled but all lead to a scar faced man who seems to now be following her. Spending time in Adria with her grandfather, a diplomat on Embassy Row, she’s afraid she is literally going mad. Her friends Noah and Alexi are there to hold things together when she unravels, but the anxiety and flashbacks are coming on stronger and more frequently. 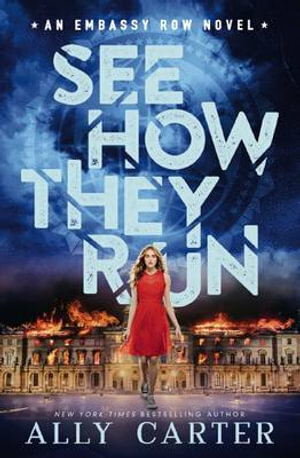 A plot driven, action packed story, See How They Run is riddled with past tradition, secret societies and murder. I’ve struggled a bit with this series because it is so much darker than anything else Ally has written. I put it down at one point, then came back after a break to finish it out. You will definitely want to read book one to be able to decipher all that is going on. There are many layers to the story and the cliffhanger left me needing book three! I enjoyed the dynamic between Grace and her brother as well as the sparks. I would recommend the series for older teens as there is some violence and the tone is more dark than the Gallagher Girls or Heist Society series. There may also be some triggers for teens experiencing PTSD or anxiety. There is lots of history woven in to the backstory and I can’t wait to see how this all unfolds. ALL FALL DOWN is the first book in my new Embassy Row series. It was published on January 20, 2015 and will launch a new three-book series with Scholastic.